The ultra-compact PreSonus FireStudio Mobile FireWire audio/MIDI interface packs an incredible amount of I/O and features into its road-ready chassis, with absolutely no compromise in quality! You get a pair of premium XMAX preamps, full 48-volt phantom power, and the flexible analog and digital I/O you need. The FireStudio Mobile even comes complete with a full version of PreSonus Studio One Artist production software, amazing effects, and virtual instruments! When you want the power to make professional-grade productions anywhere, you need the FireStudio Mobile! Many bus-powered mobile interfaces deliver much less than the full 48 volts of phantom power that is specified by microphone manufacturers. This means even the finest condenser microphone can’t work at optimal internal gain levels, potentially compromising sound quality even before the signal gets to the mic preamp! PreSonus created an “internal switching power plant” that lets the FireStudio Mobile convert computer bus power into a full 48 volts of phantom power, as well delivering 30 volts to power the FireStudio Mobile’s premium mic preamps. 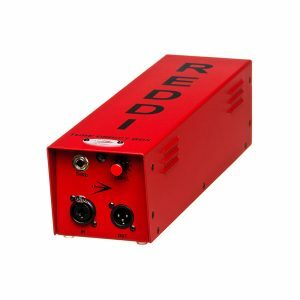 The FireStudio Mobile includes custom-designed, high-voltage, discrete, XMAX Class A microphone preamplifiers that are suitable for use with all types of microphones. A cheap, off-the-shelf, op-amp-type mic preamp delivers thin, noisy, harsh results. But with XMAX preamps, the sonic quality is limited only by what microphone you plug into it. The XMAX preamplifier runs on power rails of 30V, delivering more headroom, deeper lows, smoother highs, and a richer overall sound. XMAX preamps also use genuine transistors, resistors, and capacitors (op-amps add noise, coloration, and harshness to a signal). 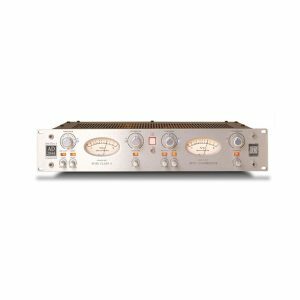 The FireStudio Mobile’s preamps offer discrete design delivers ultra-low noise and transparency, while their Class A circuits deliver purer, clearer, and more musical results than the Class AB designs that are found in many preamps. The net result of the XMAX preamp design is high headroom, low noise, wide dynamic range, extended frequency response, and — most importantly — musicality and transparency, with smooth highs, solid deep lows, and everything in between. A pair of 3-LED level/clip indicators let you check the signal levels for channels 1 and 2, and a button enables 48V phantom power for the two mic channels. Also on the front panel are gain knobs for the two mic/instrument inputs and for the main stereo outputs and a stereo headphone output with gain knob. 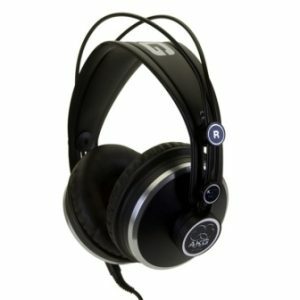 Gain for the mic inputs ranges from -10dB to +70dB; the high-impedance instrument inputs range from -30 dB to +50 dB of gain. Finally, a power/sync indicator LED shows whether the FireStudio Mobile is receiving adequate power and is correctly receiving word clock. For a compact, portable unit, the FireStudio Mobile is loaded with I/O! You get a pair of combination XLR/TS mic/instrument jacks, which are in the inputs for channels 1 and 2. The XLR mic inputs are routed to the aforementioned XMAX solid-state mic preamplifiers. The high-impedance, TS instrument inputs let you plug guitars or basses directly into the front panel. On the back are six more balanced, 1/4″ line level inputs for channels 3 through 8, plus a DB9 connector that accepts a breakout cable (included) to provide stereo S/PDIF digital I/O and MIDI I/O. 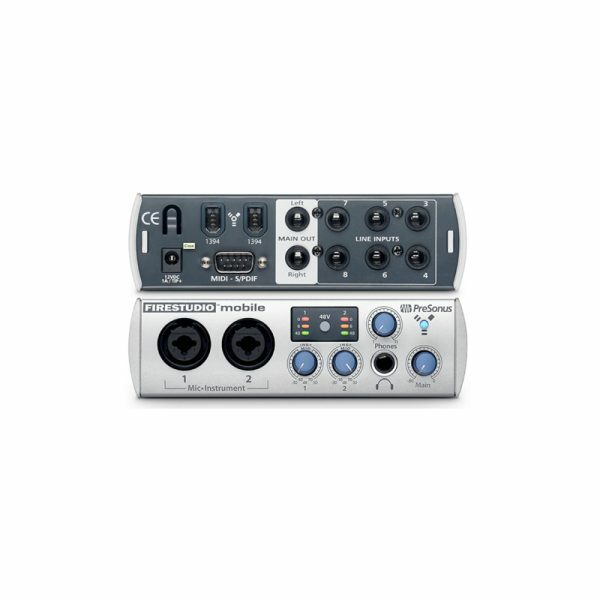 You get two FireWire 400 ports: one port connects to your computer, and the other can be used to connect a hard drive or to daisy-chain any FireStudio-family interface, so you can easily integrate the FireStudio Mobile into a larger system. Like all members of the PreSonus FireStudio family, the FireStudio Mobile comes bundled with control software. Control is a powerful, flexible, and easy-to-use control-panel application that allows you to daisy-chain to up to four FireStudio family devices for a maximum of up to 52 inputs and outputs. FireStudio Mobile’s A/D/A converters have a dynamic range of 118 dB for unbelievable clarity. Synchronization to your computer is stable and robust, thanks to JetPLL synchronization technology. JetPLL incorporates noise shaping to virtually remove all audio-band jitter, ensuring near-perfect clock performance and optimal converter performance when networking two or more digital-audio devices. JetPLL quickly locks to any digital format through a wide range of frequencies and is extremely robust and tolerant of wide variations in clock frequencies. 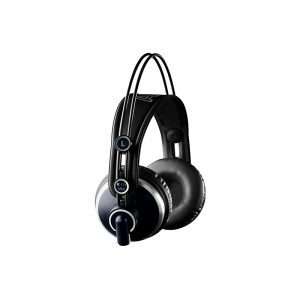 As a result, you’ll experience better stereo separation and clearer, more transparent audio. The FireStudio Mobile is bundled with an exceptional software package, featuring PreSonus Studio One Artist, the amazing new DAW software for Mac OS X and Windows XP and Vista that makes producing high-quality projects easier than ever before. You also get 20 new PreSonus Native Effects plug-ins and virtual instruments plus a generous bundle of third-party loops, software, and instrument sounds. The PreSonus FireStudio Mobile packs an amazing studio setup into a go-anywhere compact interface!